Seattle officials are investigating the unpermitted cutting down of more than 150 trees on public land in the West Duwamish Greenbelt in West Seattle. 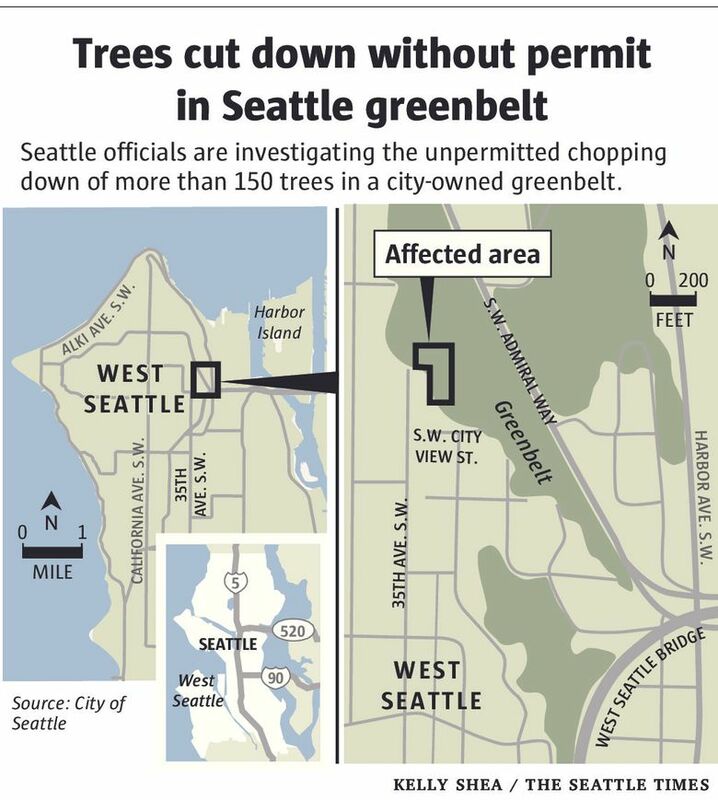 Seattle officials are investigating the unpermitted cutting down of more than 150 trees in a city-owned greenbelt next to homes in West Seattle. The City Attorney’s Office is heading up the investigation into the decimation of part of the greenbelt, Assistant City Attorney Joe Groshong said. 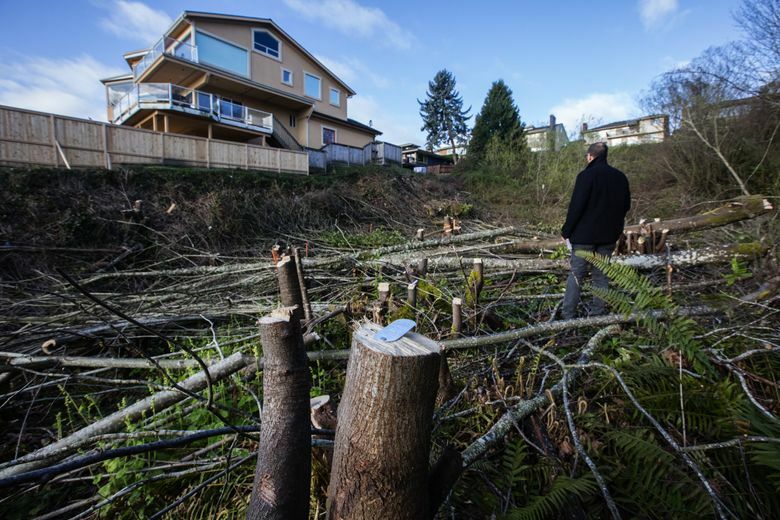 The clear-cut area, on the hillside north and east of the 3200 block of 35th Avenue Southwest, above Southwest Admiral Way, belongs to the Seattle parks and transportation departments, parks department spokesman David Takami said. The trees Friday lay where they were downed, crisscrossing more than an acre of the hillside. Their stumps, some a couple of feet in diameter, jutted through the debris. Numbered metal tags have been nailed to many of the stumps, presumably by investigators. Groshong and Takami provided scant details about the case. There was no answer Friday at the home nearest to many of the destroyed trees. Jeremy Adams, a landscaping-company employee working at the home across the street, said he didn’t see the trees being cut down. Jon Jainga, urban forestry manager for the parks department, said officials have counted 153 downed trees. Most of them were mature big-leaf maples, he said. Seattle law prohibits the removal of trees from environmentally critical areas without prior approval, Jainga said. 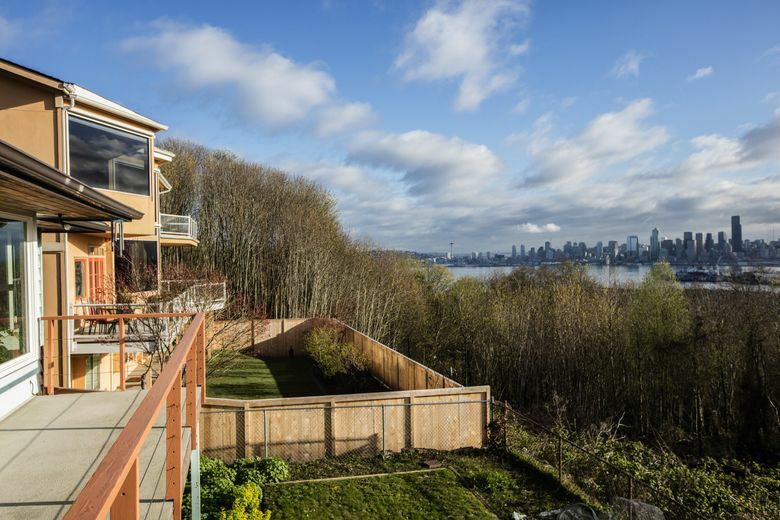 The clear-cut West Seattle area, part of the West Duwamish Greenbelt, is considered environmentally critical due to its steep slope, he said. Trees provide wildlife habitat, combat air pollution and help stabilize slopes by managing surface water. The clear-cut area is part of a known landslide zone, Jainga said. He declined to comment on whether other laws may have been broken. Illegal tree removals have long been a problem in Seattle, said Cass Turnbull, whose nonprofit, Plant Amnesty, teaches people how to care for urban trees and shrubs. The culprits are usually homeowners trying to improve their views, she said. Seattle officials don’t have a great track record for delivering tree justice, she said. Many illegal removals involve only a handful or a dozen trees. But there was the 2002 case of Jerome Farris, a federal judge who wound up paying a $500,000 fine and more than $100,000 in interest after his gardener cut down more than 120 cherry and maple trees in a Mount Baker neighborhood park to improve the view from his home. Farris blamed misunderstandings, and then-King County Prosecuting Attorney Norm Maleng declined to pursue felony charges, which require proof of malice. Rather than slap the judge with misdemeanor charges, then-City Attorney Tom Carr issued the fine, to be used for planting new trees and otherwise improve the park. Jainga said officials have been working to restore 2,500 acres of Seattle woodland by 2025. He said restoring the West Duwamish Greenbelt will be more difficult now.